When I learned that Panto producing behemoth Qdos was attempting to muscle in on the Glasgow market, I found it difficult to see what they hoped to bring to the city that it didn’t already have. And although we’re no fans of most of the existing pantos, each has its own niche. So, my initial response was an urge to resist this commercial interloper – particularly after I read about their national sponsorship deal which involved incorporating Churchill the dog into every one of their pantomimes. But when they announced all round entertainer John Barrowman as their leading man we succumbed to the draw of a star name. And even the later casting of the Krankies wasn’t enough to dampen our enthusiasm. The question remains though – does Glasgow need another Christmas show? And if so, is "Aladdin" it? There’s no denying that bringing Glasgow-born Barrowman home is a major coup. Glasgow has always had a tradition of creating its own pantomime stars – most recently the late, great Gerard Kelly. But even back in the days of Rikki Fulton and Stanley Baxter they didn’t have the same profile John Barrowman has achieved both nationally and internationally. And from the response in the audience it was clear who most of them (us included) had come to see – and we didn’t leave disappointed. In an age when many celebrities and 'stars' have obvious limits to their talents, it’s great to see one live up to the hype. But what of The Krankies? Well, they very quickly overcame any reservations we had with some clever in-jokes, impressive physicality and some perfectly played contrived corpsing. We're never going to be huge fans of their humour, but we can recognise that they are absolutely brilliant at what they do. And any similar scepticism about the use of a “3D Genie” vanished just as quickly once we reached the first of several 3D scenes. The effects are stunning – much, much more effective than I had expected them to be. Waldorf may have sat calmly in her seat but I’ll admit to flinching as something flew past my face - and others in our party visibly jumped. The effects provide a huge WOW factor to the show, as does a beautifully executed scene that sees Barrowman flying above the first few rows of the stalls. The script on the other hand could do with a little more polish. It could be sharper at times, and there isn’t really any concerted effort to make us care about the characters or hide the fact that this is a Barrowman/Krankies vehicle. And while you can argue it’s just giving the audience what they came to see, it’s a waste of a strong supporting cast who appear capable of delivering much more. I’d also have to say that some of the gags based on John Barrowman’s sexuality would have given me concerns - were it not for the fact that he is so clearly the star of the show and has presumably given his approval to the script. 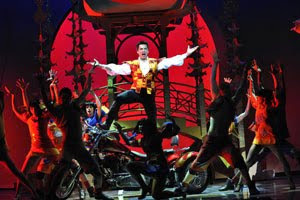 The show appropriates a number of pop songs jukebox-musical-style rather than using an original score. To me it felt like a shortcut too far, but it certainly gets the audience going and no one else I’ve discussed it with had any objection to it. Nor did I hear anyone object to the short scene featuring Churchill. Yes it felt ‘dropped in’ but by that time I could see where my ticket price had gone – if it requires a financial top-up from an insurance company then I can live with that (but do allow us to register mild disapproval by being a little mischievous with our weblinks). Whilst star names, high production values and technology all contribute to the show’s success, its biggest asset may actually be the venue. We may have seen it at its best in Row D of the stalls, and the lack of significant raking does give me some concerns, but we felt the Armadillo really worked for this kind of show. It has comfortable seats with plenty of legroom – and even the sweet stall prices weren’t ridiculous. If you were to put the same show on here and at the Kings, I would pay an extra £5 for the ticket without hesitation – and in truth probably another £5 without grumbling too much about it (but I would still moan about the £6 SECC car park charge). But I do worry about what that means for Glasgow's theatres, and with the terrible weather it might be difficult for anyone to quantify the impact Aladdin has had on the other theatres. On a more positive note, I generally believe that theatre-going is a habit and that the more you see, the more you want to see - so if people have been lured in by Barrowman and the 3D genie, perhaps they’ll consider seeing other shows (now or throughout the year).